At FS Construction Services, we understand that there can be a pretty big gap between “I think I would like to build a pole barn,” and, “Look at this new pole barn I have.” Our job is to make the distance between those two statements less daunting and a lot more exciting. The decision to build a new pole barn or wood building is a big one, and for most people, it involves a lot of details that don’t necessarily scream “fun” (we’re looking at you, building permits). This is why we at FS Construction Services rely on a simple six step process to move you from conception to completed construction. Our goal is to make the whole process as simple and headache-free as possible. First, we listen! The experts at FS Construction Services will discuss building options to fit your needs and budget. We’ll help you decide on the right design, accessories and features whether the building is commercial, agricultural or suburban. Next, we will develop a Scope of Work. This includes the development plan, elevations (renderings from the sides, front, and back that show the building from the foundation to the roof), and conceptual drawings of your custom-built pole barn. You will then receive a thorough and detailed contract from our building and construction professionals. The building contract clearly lists all the elements of your project: foundation, structure, doors, windows, paint, etc. We like to think of ourselves as the friend who has your back. So rather than leave the excitement of paperwork to you alone, we can even help prepare the documents required to apply for building permits and inspections. With every ‘i’ dotted and ‘t’ crossed, the fun part can really begin. Our experts will provide you a construction schedule and begin construction of your new Walters Building. Construction concludes, and your dream building is now a reality. At FS Construction Services our goal is to make sure that when your building is complete, you not only have the peace-of-mind to enjoy it, but that the finished product matches your vision. Got a building project that has been on your mind? Contact the professionals at Gateway FS Construction Services now. You can depend on us to provide the best products and services at the best possible price. For more information on your next wood building, pole barn or even steel building, contact us at 866-551-3454. We look forward to providing you with the best customer service experience. Have an Exterior or Interior Paint Job? You Came to the Right Place. Sometimes, all you really need to transform your home or building is a fresh coat of paint. From stained siding to chips and scratches to dull (or too vibrant, for that matter) color choices, there are lots of things that can drag down the general appearance and satisfaction you feel when looking at your home, barn, or business. If you think it might be time to update the exterior or interior paint on your structure, FS Construction Services is the right place to go. Because FS Construction Services is a distributor of Valspar paint, we have over 1,000 colors and variations to offer. When paired with our X-Rite Color Matching tools, you can be sure that the color you want is the color you’re going to get. We complete this process by using our tethered spectrophotometer, which, although it sounds like something out of a science-fiction novel, actually allows us to scan any color, from any source, and generate an exact color match. Our team of paint professionals can easily update the interior of your home, office or structure. It’s amazing what a fresh coat of paint that is expertly applied can do for your project. From single room projects to full building interiors, FS Construction Services provide the best in professionalism and craftsmanship. Not only that, but our exterior paint team is equipped with a 70 ft. boom truck, a self-contained high-pressure power washer, and an airless paint sprayer, meaning if you’ve got a house, pole barn, shed, grain bin, roof or commercial structure that needs painting, we can tackle the job. For exterior projects, the FS Construction Services paint services team begin with power washing to remove dirt, grime, old paint, and rust, and are then followed with a high-quality primer and high-quality top coat finish. Brian “Boomer” Garleb and our team of experts will match the right kind of primer and paint to your building’s surface to guarantee a long life of rust-free, brilliant color. 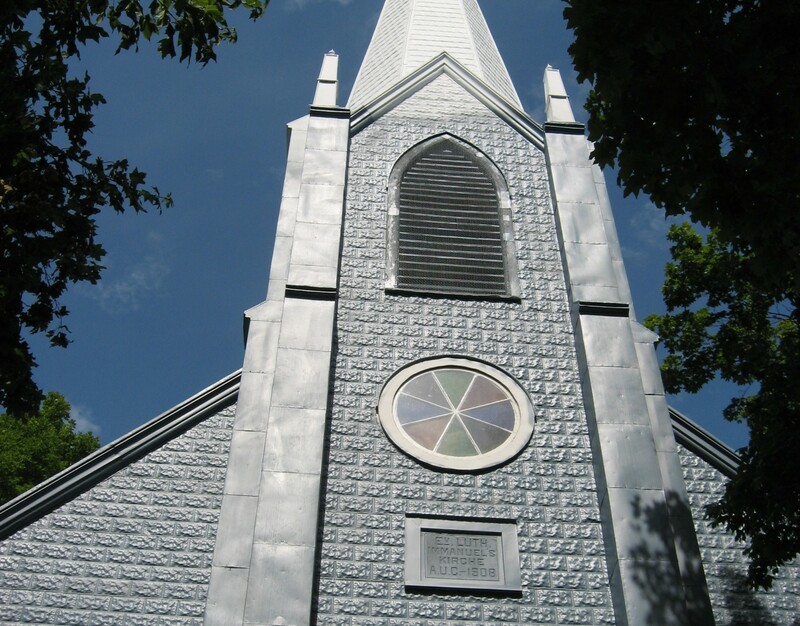 Whether you need a zinc primer for a metal roof, a fibered aluminum paint for a mobile home, or any other type of variation, our crew will be ready to bring out the best in your structure. We offer free estimates for interested parties, so please feel free to contact FS Construction Services with your paint questions. With years of experience and expertise, we’re happy to meet your every paint need. 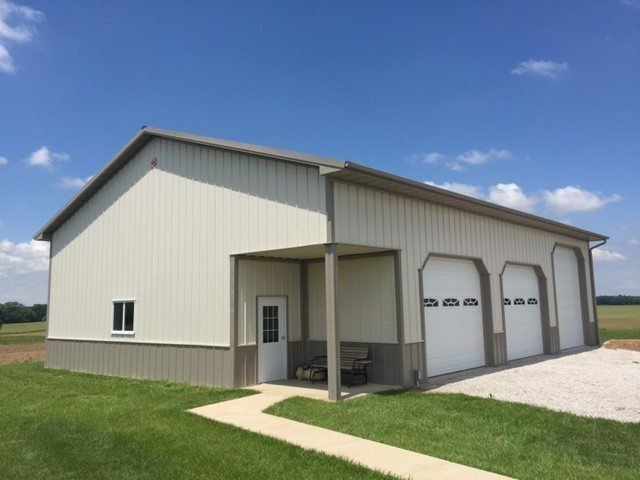 You can depend on Gateway FS Construction Services to provide the best solutions for all your Paint, Pole Barn / Wood Building, Steel Building, Grain System, Garage Door, Roofing, Siding and Seed System products and services. For more information contact us at 866-551-3454. We look forward to providing you with the best customer service experience. At FS Construction Services we believe that no two projects are exactly the same, and each individual customer deserves a targeted, specific solution to best meet their needs. Of course, sometimes the best solution is just to go big. This was the case last summer when a long time FS Construction Services customer needed a new storage structure that could store over 55,000 bushels of grain. Working together with one of our Grain Systems experts, Nathan Koester, it was decided that the ideal solution would come in the shape of a high-strength, galvanized steel Sukup grain bin. This impressive grain bin featured a diameter of 48’ with an eave height of 33’ and a 48’ peak. The 48’ Sukup structure also came fully loaded with an 8’ Sukup Power Sweep, a 10hp centrifugal fan, and the other additional features that are included when you purchase a grain bin package. 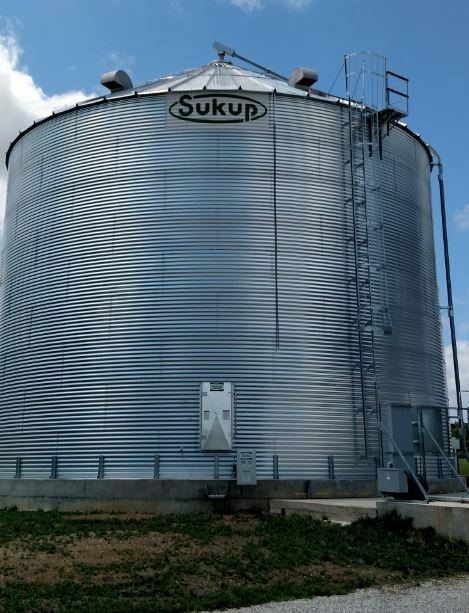 Also, standard to Sukup grain bins are the 18” virtually indestructible poly vents that are designed to release unneeded moisture while preventing dirt and other debris from entering the bin. All together, in less than a month’s time, our client had a brand new, totally equipped, storage solution that was ready to be placed into action at harvest. And thanks to Sukup’s sturdy, corrugated steel construction, it will be a solution that will last our client for many years to come. At FS Construction Services, we know that what works for one person, may not work for the next. That’s why we’ve sought out the best partners in the business including Sukup, GSI and Brock. This ensures we can provide the right building and the right equipment for any job that customers bring to us. From smaller 18’ grain bins to commercial storage capacities of over 1.25 million bushels, FS Construction Services is there to find the best option for you. If you’re on the lookout for the next essential piece of grain storage, drying, or handling and transfer equipment for your operation, call FS Construction Services. You can depend on Gateway FS Construction Services to provide the best solutions for all your Pole Barn / Wood Building, Steel Building, Grain System, Garage Door, Roofing, Siding and Seed System products and services. For more information contact us at 866-551-3454. We look forward to providing you with the best customer service experience.